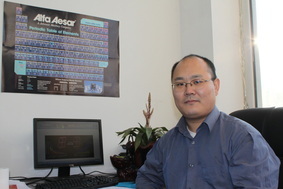 Zhong-Ming Sun is an experimental chemist interested in the solid state chemistry and organometallic chemistry. He received his B.S. degree in Applied Chemistry from Wuhan University in July 2001 and his Ph.D. in Physical Chemistry from Fujian Institute of Research on the Structure of Matter, Chinese Academy of Sciences in July 2006. After a postdoctoral stay with Prof. Lai-Sheng Wang at Pacific Northwest National Laboratory, he moved to North Dakota State University and joined Prof. Pinjing Zhao as a postdoc towards on the development of new synthetic methods and mechanism investigation. In Sept 2010, he accepted a full professor appointment at Chang Chun Institute Of Applied Chemistry, Chinese Academy Of Sciences (CIAC). Research in his group spans lanthanide organometallics and catalysis, Zintl clusters and luminescent probes based on functional materials. He has published more than 60 peer-reviewed papers with an h-index of 26. 1. “Methoxy-Directed Aryl-to-Aryl 1,3-Rhodium Migration" J. Am. Chem. Soc. 2013, 135 (46), 17270–17273. 3. “Rhodium-Mediated Decarboxylative Conjugate Addition of Fluorinated Benzoic Acids: Stoichiometric and Catalytic Transformations” Angew. Chem. Int. Ed. 2009, 48, 6726-6730. 4. “Rh(I)-Catalyzed Olefin Hydroarylation with Electron-Deficient Perfluoroarenes” J. Am. Chem. Soc. 2010,132, 6935-6937. J. Am. Chem. Soc. 2007, 129, 9560-9561. 6. "All-Metal Antiaromaticity in Sb4-Type Lanthanocene Anions"